The Mediterranean heat was unbearable and I headed north to flee the heat and vacationing tourists into… nothing. Long distances between waterspouts and further distances between grocery stores had me stealing grapes from vineyards. The freak storms that rolled through peppered the ground with hailstones (remember, 40°C+ during the day) the size of fat raspberries and shook the ground with deafening thunder. When I made it to Lake Como, the only space available was this beach chair, so I slept on it. Back into the mountains, towards the Dolomites. I had great expectations for the Dolomites: sharp peaks, high passes, wiggly roads. My route was based on road bike itineraries, (the kind of tour where they hire a car, sleep in nice warm pre-booked beds under nice solid roofs, and don’t carry any baggage. Yes, I have dreams too). I decided to take three of those itineraries and string them together, because I am incredibly reasonable sometimes. The Alps played fair and cyclists love them. The Dolomites have no mercy, they don’t play fair, and they really don’t care what you think about that. I did passos blind: no clue as to where the top was, no clue as to how long the road was, no clue as to the average grade. It was a gambling game: If this was the highest, the steepest, the longest, the hardest, do I have time to start climbing it now? I saw very few cyclists and not a single other bike tourist. Here’s my theory: these intelligent people did more than my 3 minutes of Googling, realized, Oh, wow, these roads have grades that are 18% and the forecast is always stormy. Honey, how about we do the French Alps instead? The Dolomites will not accept a 50% effort; they will simple turn you around. All or nothing, every day, all day. Climb passo, dodge storm, climb passo, hide from rain. I was exhausted and usually wearing wet clothes. I couldn’t see anything at the mountaintops due to fog and the temperatures continued to drop. At the top of Passo Lavazè, a couple from Bolzano fed me pasta and gave me their address and contact information in case I wanted to stay with them. These people are saintlike. The storms kept coming and the passos climbed higher, steeper, longer. At 18%, 3km would take 40 minutes. My front wheel wove and I was out of the saddle just to go walking pace. At the top of Passo Valles, there was a single building. I looked at the map: if I went down the other side of this passo, the way back to Switzerland increased by a number of passes and 100-150km, and I wanted out. Now. I asked the bartender if I could pitch my tent behind the hotel for the night and he miraculously said yes. I spent the evening eating cheap hot food, drinking latte machiattos and chatting to a couple from Frankfurt. In the morning, I heard a door open beside me and then, “Stephanie?” Oh please don’t make me leave yet, it’s still raining. “Hi, yes?” Don’t make me leave, don’t make me leave.“Do you want to have a shower?”. I was through that door in 30 seconds. My life revolves around the simplest of pleasures: food, water, shelter, correct temperature. You really do not realize how delicate a thread your happiness hangs onto until something as small as a zipper breaks. This zipper in particular was what I depended on to keep me dry and warm every night: my shelter. How many nights had I curled up in this little tent, full of unwavering faith that nothing, nothing would get in? The winds, snow and hail of Iceland, the bugs on the banks of the Loire River and the rainstorms of Europe all stopped at my tent door. Not anymore. Now the onslaught of Dolomite rain was a serious problem, because the zipper of my tent fly was absolutely kaput. I’m going to have to admit that I lost it at this point. I cried silent tears down a 2,000m mountain. 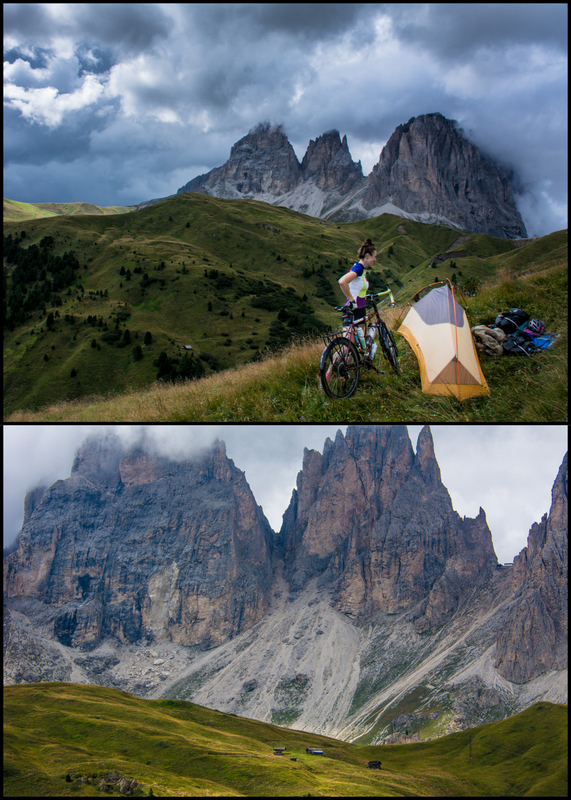 I went down the way I came up: I turned around, the Dolomites won and I didn’t care. It took 20 minutes to snap out of it (how do you cry enthusiastically while going 35kph+ steering around switchbacks? It takes talent). I bought a tarp as my replacement tent door, contacted the troops back home with my “tent emergency” and kept going. And then things turned around, like they always seem to. People make the world go round. 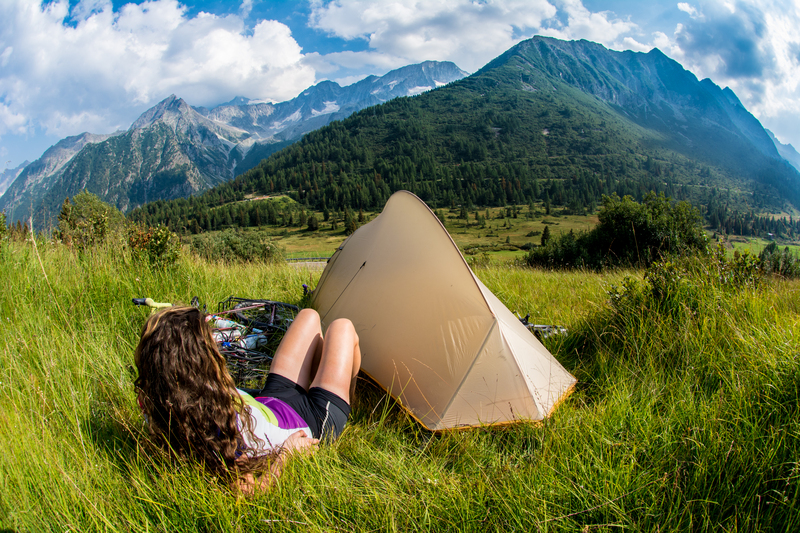 When I arrived in Bolzano the family that fed me at the top of Passo Lavazè was waiting for me, and they had received my new tent and paid €40 in customs fees for it. They also had a bed ready, food ready, vino ready, grabbed my dirty laundry, hung up my soaked and broken tent to dry, and were so nice I almost cried all over again. I taught them what the word “pampered” meant, which was harder than it sounds. I was sure that my front rack was steel and so my adopted Italian dad offered to get it welded (it had snapped, too many cobblestones, and I had temporarily held it in place with a zapstrap and tape). On his lunch break, his son cycled with me to his shop. Turns out it’s alluminio, not steel. Oops. This is what they did instead. I think it gives my bike more character. I mean, they even spray painted it! I was out of the Dolomites, but I was far from out of the mountains. Stelvio Pass climbs to 2,760m and is closed from October until June. It is the second highest paved pass in the Alps, falling short by 10m (its big brother was the highest peak on the Route des Grande Alpes that I did a few weeks ago). It’s been featured in the Giro d’Italia numerous times and has been made famous by being the Cima Coppi. The road was opened in the 1820s; it took five years to build and is the brainchild of Carlo Donegani, an engineer that became known as “progettista dell’impossibile” (designer of the impossible). The switchbacks (“tornanti”) are numbered and count down to the top. So when I passed the “48” sign, I woke up: I was finally climbing my mountain. Go go go. This was the one mountain pass that I knew inside out and backwards. I knew it would start with easy grades and I knew that it would ramp up to 14% by the end. This is one of the world’s most famous roads and it attracts all the joyriders. The comical thing about this is watching Ferraris do one-point turns around the switchbacks, and smirking when you see the guys on racing sports bikes over-revving around the tight bends in first gear, two feet on the ground walking forward (rare, but hilarious all the same). After camping at the top of Stelvio in Switzerland, 3m from the Italian border, I began the descent into rain and clouds. I came to an intersection: Bormio, Italy one way, St. Maria, Switzerland the other. I went into Switzerland. I went to a grocery store and more or less had a nervous breakdown. I knew Switzerland was expensive, but this was beyond anything I’d imagined. Food was three times the price as in Italy (at least). Wild camping is Switzerland is definitely illegal, but in a country where camping in a tiny tent with no vehicle costs $35CAD/night, I didn’t really care. I’m sure the fine is ridiculous, but they would have to catch me first. First obstacle: the cow fences. No problem. I chucked my bags over the fence and proceeded to hop over it. I had leaned my bike against the other side and when I stopped moving, I heard a strange clicking sound that was coming from my handlebars. I grabbed my seat and pushed my bike away from the fence. The sound stopped. Is this fence electric?! Well, only one incredibly stupid way to find out, right? I leaned my bike against the fence again. I touched my taped handlebars. Nothing. I touched my seat, nothing. I touched the frame. Not nothing: zap. After climbing San Bernandino Pass (a tunnel took all of the traffic, so this was enjoyable), I stayed with a couple in Locarno. The next day would grant me 3 hours in Italy which was just enough time to find a grocery store and buy as much food that would physically fit onto my bike. When I started pedaling again, I could feel the weight difference (I did buy 2 kg of apples, another kg of nectarines and about four glass jars of goodies, to name a few things); it felt wobbly and slow. All the more motivation to eat fast! Was I really going to lug this all up Simplon Pass? Yes, but I had no idea how miserable this would be. Simplon Pass is relatively high (over 2,000m), yet it’s open year round. They manage this because a lot of the road is covered. Think: tunnels. Because it’s open all year, it’s a major trucking route. In short, Simplon Pass is a complete disaster and the worst mountain pass I climbed. If I had to guess, 7km was covered/tunnels. The tunnels were dark or barely lit, with a raised curb only 8” wide on the side. The road is built like a highway: wide enough for traffic to go very fast. There was not enough light or room for me to ride on the road. Instead, I lifted my bike onto the skinny raised curb, angled it so that the bags wouldn’t hit the tunnel wall, and ran my bike through the tunnels. I would run alongside and push from the road. I turned every light I had on. When I heard a vehicle come into the tunnel (you can’t tell what direction it’s coming from), I would dart in front of my bike, up onto the curb, and plaster myself against the tunnel wall. It wasn’t fun, but I’m not dead, so it worked. Do not cycle Simplon Pass. It should be illegal. In Zermatt, I went hiking in cycling shoes (I have to keep things interesting). It turns out that cycling shape is not hiking shape, and when I finished my very easy, 3 hour “walk”, my legs were unsteady and quivering. But it’s a small price to pay for getting up close and personal with big mountains. Most of the work is done for you, because you can take gondolas up to 3,883m, where there is a viewing platform. From here you can see 38 peaks that are higher than 4,000m. I was wearing shorts. There was an open ski hill up there. When people gave my bare legs strange, incredulous looks, I shrugged and mumbled, “Canada”. A long day and a climb over Grimselpass landed me in Interlaken, which is one of my favourite places. If you ever go, stay at Balmer’s Hostel. Anything outdoors, you can do in Interlaken, or based out of Interlaken. People raft down the river, swim in the lake, boat all day, hike and rock climb. Paragliders scatter the sky and people jump off the sides of mountains in squirrel suits. 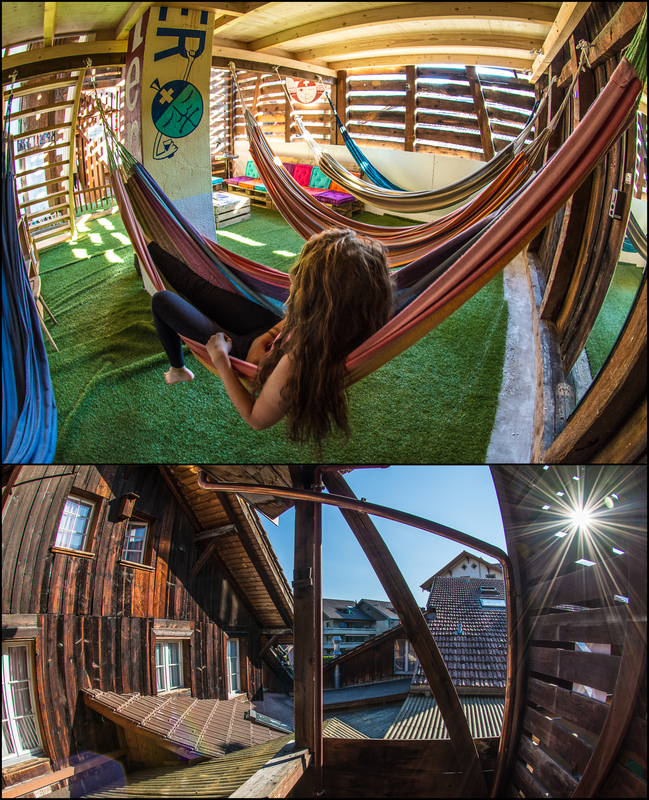 You can also just bike lazily, hang in hammocks and drink beers with great views. Passo d’Aprica (1,176m), Passo del Tonale (1,884m), Passo della Mendola (1,363m), Passo Lavazè (1,805m), Passo Costalunga (1,752m), Passo di San Pellegrino (1,919m), Passo Valles (2,032m), Passo Fedaia (2,057m), Passo Sella (2,240m), Stelvio (2,760m), Umbrailpass (2,505m), Pass dal Fuorn (2,149m), Julierpass (2,284m), Passo San Bernandino (2,066m), Simplon Pass (2,005m), Grimselpass (2,165m), Brünigpass (1,007m). FUN. 8,015 km after my departure from Reykjavìk, I coasted into the little town of Nänikon, near Zürich. Four months ago this seemed like a distant location and the closer I got to the mountains, the further I realized it was. Even in Luzern, munching raclette, 70 km to go, it seemed like a location I would never get to. Barely out of Reykjavik, shivering in a brutal headwind that I thought could not get any worse (but turns out is just Iceland’s “normal”), four months seemed eternal. But four months flew past and the kilometres went with them. I’ve camped through hurricane-force winds, slept in snow and wet thundering storms. I have eaten too much Nutella, binged on croissants and baguettes and chowed down so much muesli that I don’t think I can ever eat it again. I’ve stayed with strangers and left as friends. I’ve been completely alone on mountaintops without so much as a cow to keep me company. I know what it feels like to cry on a bike and still not stop pedaling. I’ve gone over 80 kph down mountains, I’ve shot through hypnotizing tunnels so fast it felt like I was playing a racing video game (podracing, perhaps?) and had a few near-death near-misses. I’ve been covered in chain grease and road dirt since the beginning. I’ve crashed once, fallen down a couple times, dropped my bike too many times to count and was always a little bruised. I have tanlines that will put yours to shame. But I like my ridiculous tanlines. I like my repaired front rack. I like my totaled tent. I love my bike. I love that I have adopted parents all over Europe; this is my kind of networking. I enjoy using shampoo as shampoo, conditioner, soap, shaving cream and laundry detergent. It makes things simple. Of course all of it wasn’t a joy ride, how could that possibly be? The light at the end of the tunnel always starts out small. You have to fight uphill sometimes. You have to earn that exhilarating 60km race down the mountain. You pay for clear skies with storms, and you get through the storms all the same. The road isn’t always straight, but it will get you there… or, somewhere. I don’t know where I am going next, but I have a backpack and soon enough, probably a plane ticket. Stay tuned!